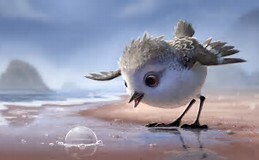 The six-minute film with no dialogue tells the story of a baby sandpiper, a kind of bird that lives by the ocean. 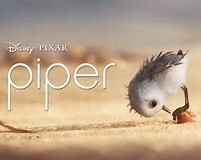 In the film “Piper” has come to the age where her mother begins to teach her that Mom will no longer be dropping food into her open mouth. Piper will have to hunt clams as all grown sandpipers do. But the first lesson doesn’t go well. As a wave comes in, the adult sandpipers know to run away, but Piper gets buried under it. Totally shaken, she runs for the tall seagrass of home and begs to be fed by Mom again. But Mom refuses. Piper tries again. 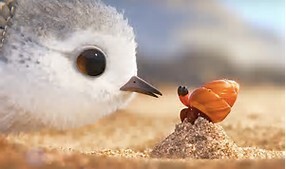 She follows a baby hermit crab into the shoreline and watches him burrow into the wet sand for protection right before the next wave hits. Piper copies him and this time opens her eyes underwater. There she finds what is almost a miracle. As the wave builds, she can see all the clams pop up before sinking below the surface. Now she has a mental map of where every clam is. This knowledge gives her the ability to quickly feed herself and to help others get food. 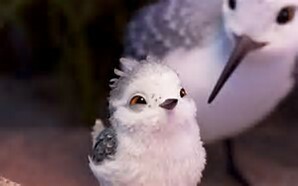 Barillaro’s film uses a young creature to teach some good lessons. Jesus also used a child as a teaching tool for His disciples. One day Jesus asked His disciples what they had been arguing about as they walked along the road. They didn’t want to tell Him because they were ashamed. Not too ashamed that they did it but ashamed for Him to know about it. But He did know. He told them they had been arguing about who among them would be the greatest in the kingdom. Jesus wanted to teach His disciples all He could in the three years He would be on earth with them. But, when they were busy arguing amongst themselves about who was the greatest, they weren’t able to learn anything. Their focus was on themselves. So He told them straight out “unless you change and become like little children, you will never enter the kingdom of heaven.” Why “children”? Because little children are often fascinated with what is going on around them. They are usually not self-absorbed. They only become that way as they grow older. To become a follower of Jesus you have to be humble enough to be teachable. Warren Wiersbe points out that an unspoiled child has the characteristics that make for humility: trust, dependence, the desire to make others happy, and an absence of boasting or selfish desire to be greater than others. In our natural state, most of us don’t have that kind of humility. Given a choice, we would rather be celebrities than servants. But to follow Jesus means to go down a different path: to put Him first and then to think of others before ourselves, as He did.